Disclaimer: Tyson doesn’t know who I am and I’m not advertizing for them. Have you seen these Tyson roasts in the meat section of the grocery? They cost around $12 and they are so worth it. I’ve tried both the beef roast and pork roast and I’ve seen that they sell beef stew, but I haven’t tried that yet. It takes about 2 minutes to have dinner in the crockpot. Open the meat and put it in the pot. Open the veggies and toss them in on top. Mix the seasoning packet with 1 cup of water and pour it in. I like to turn the broth into gravy. Put a couple spoons of flour in a container with a tight fitting lid. Add some water and shake the daylights out of it. You want it to be thick, but well combined and pourable. Whisk the thickening into the broth that is still in the crockpot and your gravy is done. Looks yummy, can I come over?? I’ve never seen these, but I’ll be on the lookout. Seems like a really good idea. I have seen these and have been skeptical, but that looks easy! I’ve never seen these – just came from the grocery store. I’ll keep an eye open for them because they look very convenient. I use these ALL the time – usually a couple times a month. 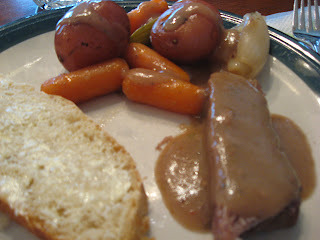 I love the pork roast and beef roast, but the beef stew is not great. Are you kidding me? Cheap, easy and it tastes good, too? I’ll be hunting for these on my trip out. I’ve seen those in the grocery and wondered how good they were. Now I will have to try one! Oh, that looks de-lish! I haven’t seen that…but I’m all for easy dinners on weeknights and only $12, what a steal. Thanks for sharing…putting it on my grocery list right now! I’m not sure of the seasoning, but I think it has some thyme in it. Add salt and pepper and maybe a little garlic. Walmart in NY has this item..it is located in the meat section. Tried one of these today and trust me folks, THIS KIT IS FANTASTIC!!!! A chef couldn’t have done it better nor more easily. In my opinion, for the money, you simply can’t get a better tasting, more easy to prepare meal. 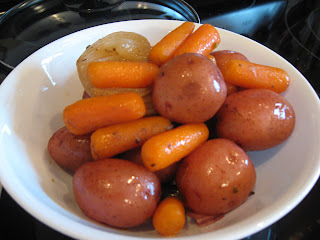 The only thing that MIGHT make it just a little bit better is giving a little bit more veggies in the packet (Potatoes and Carrots–the onion and celery amount was fine). One thing you also might want to try (what I did) was to combine a McCormick Pot Roast wet seasoning pouch, also sold at Walmart, the same place I got this kit from. The seasoning kit is in the aisle with all the other seasonings and cost about $1.80 but boy did it really create a super roast! The kit comes with it’s own seasoning packet as well (dry packet) which I also used. I just happened to have the McCormick pack in my cabinet so I figured I would add it in also. I am so glad I did that, it was an incredibly delicious beef roast. I love this seasoning kit that comes in the roast but it just is not enough in a larger cooker. Any idea what is in that packet. I have even researched “glutamates” etc, and cant find it, Does the McCormick taste the same? Also is the wet seasoning pouch on the same aisle as the dry seasonings? 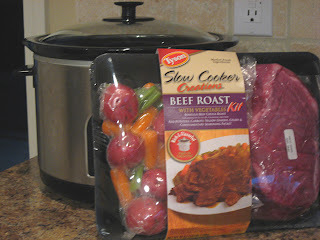 You can find an ingredient list at this website – https://www.tyson.com/products/ready-for-slow-cooker-beef-roast. I’m not sure about the taste comparison between Tyson and McCormick. As far as location, this kit is in the meat section, but each store may vary as to where the wet seasoning pouch can be found.